Since their launch two years ago, South Korea’s two internet-only banks, Kakao Bank and K bank, have steadily built up a sizeable user base, proving the merits of branchless banks to financial consumers here. 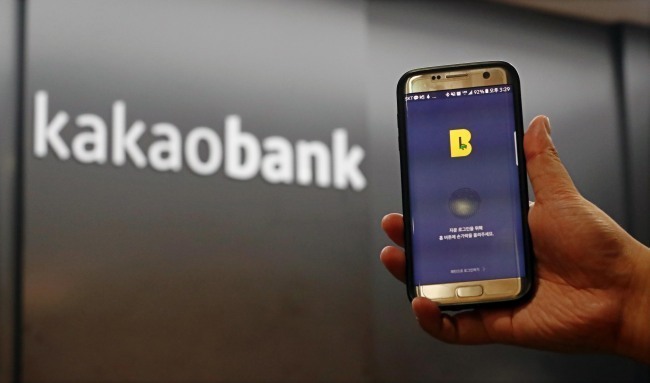 And now, Kakao Bank, run by Korean mobile messaging giant Kakao, and K bank, led by telecommunications firm KT, have set out to expand the scope of their business through capital injection enabled by a recent change to the local banking law. However, the two firms have encountered new regulatory hurdles that could slow down, if not block, their plans to secure a controlling stake in their respective banking entities. Further challenges are expected down the road, as up to two new internet-only banks will begin operations from this year, increasing competition. Kakao and KT recently took steps to increase their stakes in their respective banks, after a new banking law designed to ease ownership rules for internet-only banks took effect from January. Korea’s Banking Act stipulates that only financial institutions are eligible to own more than 10 percent of a banking entity. Commercial corporations are allowed a maximum stake of 4 percent (or 10 percent without voting rights). The law, aimed at the separation of banking and commerce, is designed to prevent commercial entities from forming their own banks or wielding undue influence on the banking sector. As a result, Kakao Bank and K bank were established with financial firms as majority shareholders -- Korea Investment Securities and Woori Bank, respectively. This structure had made it difficult for Kakao and KT to make investments or key business decisions. Following criticism that current regulations are misaligned with the founding principle of internet-only banks, Korea amended its banking law to include an exception that information and communication technology firms can own up to 34 percent of their respective internet-only banks. With expanded ownership, Kakao and KT would possess more freedom to wield control over their respective banking entities as well as inject much-needed capital to finance their business expansion. Both companies had filed majority stakeholder approval applications to the Financial Services Commission as of this month. However, the prospects of approval remain uncertain, as their past and recent fair trade violations could hurt their ownership eligibility. The special law on internet-only banks includes a clause stipulating that a company seeking to possess more than a 10 percent stake in an internet-only bank must not have violated laws related to fair trade or taxes in the past five years. However, the FSC is allowed to make an exception if it determines that the violations are minor enough to be overlooked. Due to this fair trade stipulation, there are realistic concerns that KT and Kakao will face delays, or possibly fail to pass, the FSC’s adequacy review. KT is currently being investigated by the Fair Trade Commission for collusion in a government-issued business project. If the FTC files criminal charges and refers the case to the prosecution, it could indefinitely halt the regulator’s review process. In addition, KT was slapped with a 70 million won ($61,700) fine in 2016 for violating fair trade laws in placing a bid for a project to develop a subway advertisement information technology system. Similar irregularities also plague Kakao. Kakao M, which was merged into Kakao last year, received a 100 million won FTC fine in 2016 for violating fair trade regulations in fixing the prices of online music content. The latest developments have sparked criticism that the new banking law has ended up replacing old regulatory barriers with new ones despite its goal to deregulate and spur financial technology innovation. One of the arguments is that fair trade violations should not be used as a barometer to judge a company’s preparedness to lead and operate an online-only bank. Amid mounting criticism, the FSC released a statement earlier this month defending the special law on internet-only banks and stressing how the regulator has the right to evaluate the severity of the fair trade violations at issue. “The clause stipulating the eligibility of an internet-only bank’s majority stakeholder was determined and included in the special law on internet-only banks through a deep, prolonged discussion,” the FSC said. On top of the regulatory uncertainties, Kakao Bank and K bank face another major threat: Korea’s next generation of internet-only banks that could debut by as early as June. Toss Bank, led by the operator of Korea’s leading fintech app Toss, and Kiwoom Bank, backed by the capital-affluent local brokerage Kiwoom Securities, are the two main contenders vying to obtain an internet-only bank operational license. Kiwoom Bank touts its financial strength and diverse shareholder base that includes some 30 players involved in finance, telecommunications and retail. The consortium aims to create an “open finance platform” for both customers and business operators. Toss Bank, steered by Viva Republica, operator of popular payment platform Toss, has decided to underline its forte as an innovative fintech leader. Its vision is to become a “challenger bank” that will move fast to introduce market-transformative products. More specifically, Toss Bank plans to leverage the financial information it has pooled to build a reliable credit score system for “thin filers” -- people with limited credit histories who find it difficult to get loans. With a strong CSS platform, Viva Republica believes it can introduce more diverse loans and financial products to mid-credit loan consumers who remain underserved here. A maximum of two consortia are eligible for preliminary approval, but the FSC has hinted that it may approve only one.